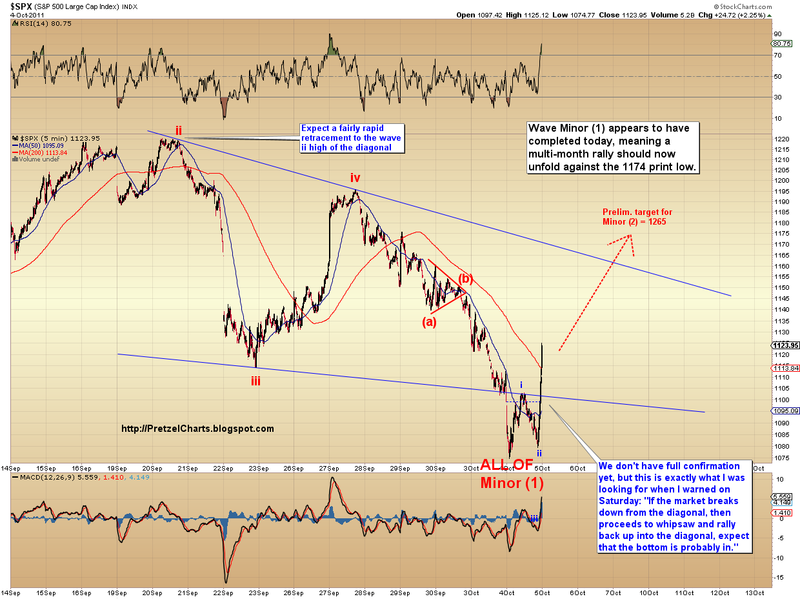 It appears highly likely that the Wave Minor (1) decline ended today at 1074. From here, I expect a large counter-trend rally, which will ultimately become Wave Minor (2). My preliminary target for Minor (2) is 1265, but as the wave unfolds, I will be able to narrow that projection down with more accuracy. The ending diagonal I first suggested on 9-22, which we have been watching ever since, appears to have reached its conclusion today. 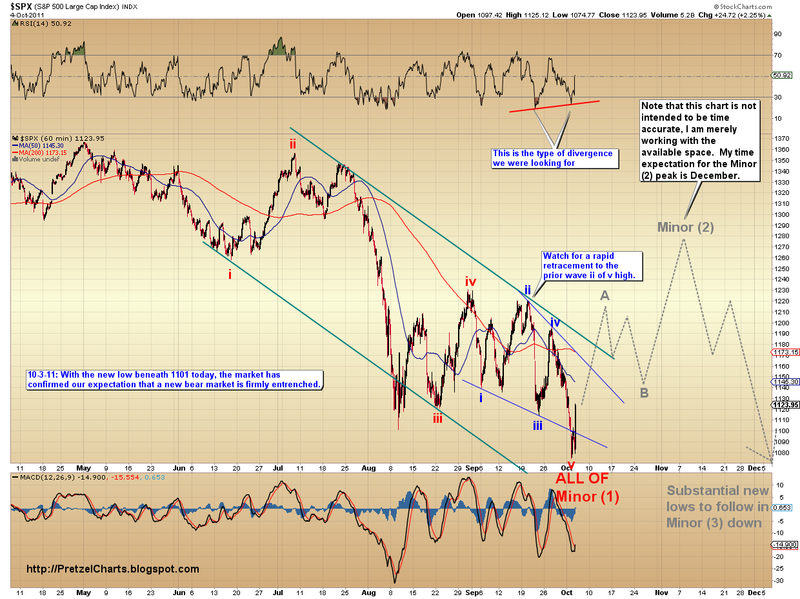 Below is the chart I posted on 9-22. Not too shabby! The chart above illustrates yet another reason why I believe that there is no tool more powerful than Elliott Wave to anticipate the market's future. 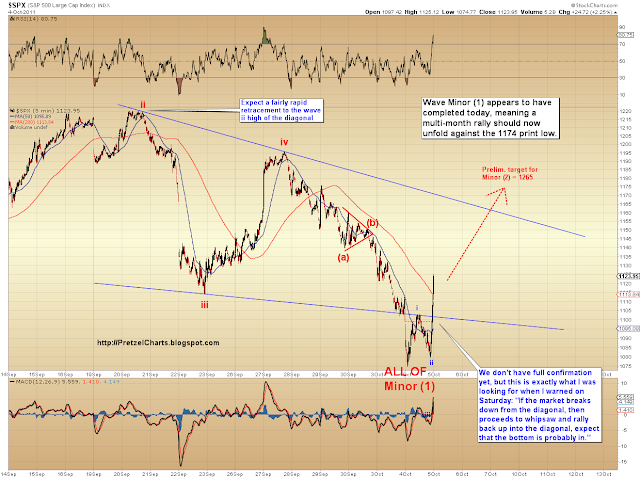 So while we have been tracking this diagonal for two weeks, I hope that I further prepared our readers for the potential end of Wave Minor (1), and the rally, when I warned yesterday and over the weekend: "If the market breaks down from the diagonal, then proceeds to whipsaw and rally back up into the diagonal, expect that the bottom is probably in." The overthrow of the pattern, and the violent rally which ensued afterwards, constitute an almost perfect textbook ending to this pattern... so this gives me high confidence that Minor (1) down has indeed ended. To be fair, the smallest wave structures have not yet given us full confirmation that Minor (1) is over, but I would be very surprised if the structure doesn't soon confirm the rally. We should have absolute confirmation within the next few sessions. 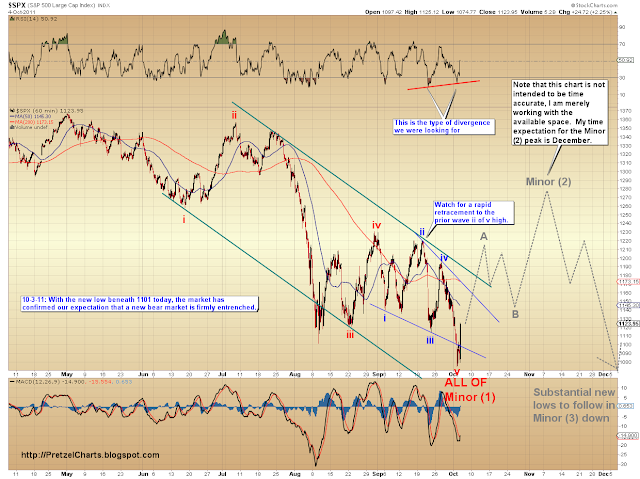 For now, I would assign a 95% probability to the view that Minor (1) down has bottomed. For those new to Elliott Wave theory, it would be helpful to check out the article The Big Picture: SPX Long-term Count and Projections. For the next chart, I'm going to focus on the intermediate picture, and the form Minor (2) up might take. Keep in mind that as the actual wave structure of Minor (2) unfolds, we will be able to use that structure to guide us to more precise targets. The best I can do with no wave structure yet to draw from is approximate, based on the larger patterns. As noted on the chart, I would expect the first leg of this rally will rapidly retrace to the prior wave ii (of v) high near 1220. That will likely form the A-wave of what will become an A-B-C rally to form Minor (2); so our first official target for A of (2) is 1195-1220. Keep in mind that the psychology of investors will probably become quite a bit more positive in the near future, so that by the time we reach the Minor (2) peak, the majority will be bullish again. It always helps to anticipate the mood, because after Minor (2) completes, we will be presented with what (I believe) may prove to be one of the greatest shorting opportunities of our lifetimes (but due to the psychology, by the time Minor (2) peaks, no one will think shorting is a good idea anymore -- just as most don't think going long is a good idea right now). I expect Wave Minor (3) to ultimately become a rapid waterfall decline to substantial new lows, although it will probably start off relatively subdued as it traces out the first couple waves. 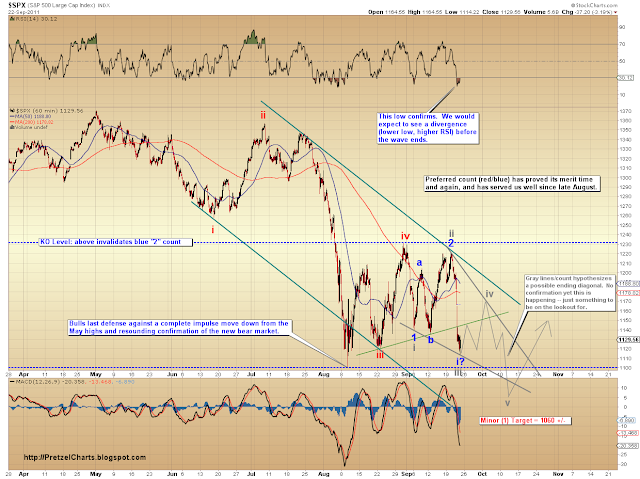 I will continue to update the charts daily as Minor (2) unfolds and begins to present us with some accurate short term targets. There is no tool more powerful than E Wave--but only the way Pretzel applies it. Prechter and some other folks seem to be contrarian indicators most of the time. A lot of people think E Wave is useless. Maybe the method will spark new interest among traders, now that you have found a way to use it that yields a high percentage of correct predictions. Might you teach some classes some time in the future? Prechter's biggest mistake was trying predict the end of a bull market before it even started. Had he left it at simply predicting the bull market, he'd be thought of differently. I'm not a huge fan of Prechter's methods, but I probably would never have discovered Elliott Wave without his book, so I owe him something. And, to be fair, Prechter actually made some very good calls in 2007-2009, although I suspect that's because someone other than him was doing the charting. But I'm far from being the only good Elliott technician out there -- there are a few others who have an excellent track record. The biggest pitfall I see for technicians is when they get too cocky, and stop examining the alternate possibilities. The toughest thing is that you have to take a stand when you make a call, and sometimes you're bound to be wrong... so just like any trading discipline, you have to be light on your feet and willing to admit if you're wrong.